Zolotonosha produced several accomplished Jews. Among them are Ber Borokhov, a Zionist Socialist leader and ideologue; Alexander Zarchin, an engineer who developed a water desalination process that was used in Israel; and Isaac Boleslavsky, a chess grandmaster. The following paragraphs contain brief biographical sketches of these people. Ber Borokhov spent his formative years in Poltava, one-hundred miles to the west of Zolotonosha, his birth place. His parents' interest in education and Zionism would have a profound influence on the central themes of his life. By Borokhov's early adult years he had joined the Russian Social Democratic Labour Party (in 1903 this party split into the Menshiviks and the Bolsheviks), but was expelled when, in 1901, he established the Zionist Socialist Workers Union. This latter party advocated the establishment of an autonomous Jewish state outside of Palestine, supporting the Uganda Plan, which proposed the founding of a Jewish state in East Africa. The Zionist-Socialists also advocated the use of terrorism in the struggle against the Russian government, and was intimately involved in the 1905 revolution. See Zionist Socialist Workers Party and Poale Zion. Borokhov played a role in the creation of Poale Zion (Workers of Zion), a Marxist-Zionist movement amalgamating Zionism and Marxism, an apparently "unnatural" combination since Zionism is a nationalistic ideology that also encourages the advancement of an individual's interests, whereas socialism is a universalist ideology. Borokhov was able to rationalize, in his essay The National Question and the Class Struggle, Jewish Nationalism in terms of Marxist class struggle. See Borokhov Archive to read his essays. Poale Zion was involved in the construction of Jewish agricultural colonies in the Crimea and in Ukraine, as well as the founding of a Jewish Republic in Biro-Bidshan. Mapaiand Mapam, Israeli political parties, evolved from Poale Zion. Borokhov was an authority on the Yiddish Language and is regarded as the founder of Yiddish Studies. Contrary to most Zionists, who believed that Yiddish was an aberration of the Diaspora that must be replaced with Hebrew as the language of a resurrected Israel, Borokhov's choice for such a national language was Yiddish. Read the Yivo article on Borokhov. Also of interest is Borokhov's essay Eretz Yisrael in our Program and Tactics and a Wikipedia article on Borokhov. Born in Zolotonosha in 1919, Isaac Boleslavsky's skill in chess manifested itself at an early age. Self-taught at age nine, Boleslavsky became the 1933 school champion of Dnipropetrovsk. He won third prize in the 1936 USSR All-Union Junior championship, followed by the Ukrainian and Ukraine SSR championships. While Isaac Boleslavsky was accumulating chess championships, he was studying philology, earning a degree in that subject at Sverdlovsk University. Boleslavsky acquired a number of other championships during the 1940's; was awarded the title of Grandmaster in 1945; and continued to win chess matches during the Cold War period, ending his competitive career in 1971. Boleslavsky trained Soviet chess players and was a highly regarded chess analyst and writer. He developed theory on chess opennings and is most well-known for his Boleslavsky Variation of the Sicilian Defense. His most famous games can be found at Chess Matches. Boleslavsky passed away in Minsk in February 1977 as a result of a fall caused by slipping on an icy sidewalk; a fractured hip developed an infection. See the Wikipedia article on Isaac Boleslavsky. Born in 1897 Zolotonosha, Alexander Zarchin graduated from the Leningrad Technical Institute with a degree in Industrial Chemistry. Listening to a lecture about Arctic exploration, Zarchin was inspired to do research into the desalination of seawater when the explorer stated that melted ice was the source of his drinking water. Zarchin did his research at the Lenigrad Technical Institute with the support of the Soviet Army and was able to develop an efficient desalination method. Despite Zarchin's contribution to his country, his Zionist leanings earned him five years in a Siberian gulag (apparently for using Hebrew letters in naming a process that he developed using magnesium in the production of certain metals); Zarchin continued his research during his Siberian interlude, where he developed a method of extracting petroleum from bitumen. After serving in the Russian Army during World War II, Zarchin became a Lecturer at the Technical Institute of Tashkent. 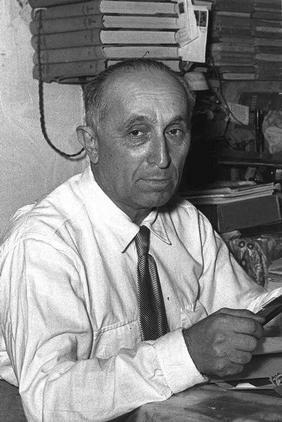 When The War ended, Zarchin made his way to Israel where he adapted his research to Israel's environmental conditions. Based on Zarchin's desalination ideas, Israel's Ministry of Development appropriated funds for the construction of a pilot plant in Eilat. This process is based on the physical effect that freezing seawater results in the formation of ice crystals of pure water. This process is energy-efficient, using about fourteen percent of the energy used to boil water. However, the pilot plant was closed after a few years and replaced by a thermal distillation plant. Alexander Zarchin founded IDE Technologies, LTD. which provides desalination technology, transforming seawater to potable water for drinking, agriculture, and industrial purposes. He passed away in 1988.